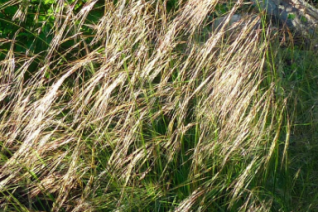 Nodding needlegrass is a clump forming species native to western California south to northern Baja CA. Fine, fine medium green foliage appears in spring and is bright and fresh. In late spring stems rise to display the metallic tan, long needle like awns. They gracefully bend in every direction and are magical when tussled by the wind. They wave and sway gracefully and the light catches glints off the flowers. Very wild looking west coast grass that is at home in any well drained soil in full sun. Adaptable to light summer water and this improves the appearance and amount of blooms. To 2′ tall in bloom the basal clumps spread to about 1′ wide. Winter deciduous. Cut back hard in early spring before new growth starts. Completely adapted to summer drought once established and is a graceful and integral part of dry plantings. Seeds around a bit- expect this. Full sun.